What goes through your mind when you wake up in the morning and see a thick orange cloth hanging outside the window of your bedroom? First you pinch yourself to make sure that you are not dreaming and then rush outside to see whether they are shooting a remake of Total Recall on location in your backyard. The view is creepy, orange turning slowly to yellow, with shadowy silhouettes that gradually materialise as trees and houses. While the red cloak rises and thins out above the city the dust settles on the pavement, benches, stairs, buildings. Even the lobbies and elevators have received their share of red sand. And all the cars seem to have just returned from a trip on an unsealed road in the outback. I read that such dust storms happen often in September around Lake Eyre. This time the strong winds pushed the dust from the outback to Sydney. Is it climate change or just a rare phenomenon? Something to rave about in media or blogs. So did the outback move to Sydney for the day? 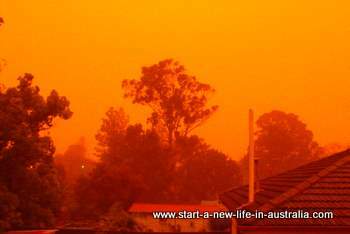 Look at the orange photo - if you have never been to the outback, that is how you might imagine it: monotone, just red and very dry. That is how we thought it was before heading to Alice Springs. And what we found was just the opposite - a red centre beaming with life and vivid colours. But back to Sydney, the dust storm is a rare event, hopefully, and just adds to the excitement of having Sydney as our hometown. We decided to start a new life in Australia and moved to Sydney in 2002. And while we adjusted to our new life and learnt many new things we thought to share them and built a website on how to start a new life in Australia. We hope to provide helpful information to other people who are thinking to visit or move to this amazing country.